EZproxy is the tool that lets XJTLU library users access databases, ejournals, and ebooks from off-campus using a XJTLU account and password. When you are on-campus (either on a campus computer or the wireless network), library databases and publishers recognize a campus IP address and know that you have permission to use subscription library resources. But, since our databases and publishers are only licensed for XJTLU students, faculty, and staff, they need to have a way to verify that an off-campus user is legitimately affiliated with XJTLU. EZproxy is the tool the XJTLU library use to verify that someone is an authorized library user. In general, you do not need to do anything other than find the resources you want from library databases and click on the link. 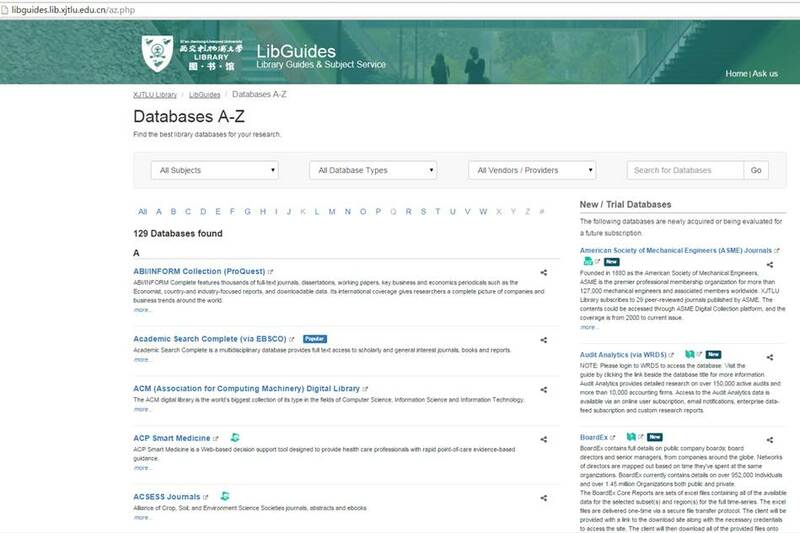 If your device is connected to campus network, you can directly access the database through link on Library website: http://libguides.lib.xjtlu.edu.cn/az.php. If you are off campus, you can also click the database link. The only difference: You are required to input XJTLU account and password. After the authentication, the system will redirect to database. Then you can use the database just as on campus. Moreover, you can access all data resources searched from Discovery after authentication off campus. All the operations are same as on campus. For example, if you search xin gai nian ying yu in Discovery, you can still view the search result off campus. But for detailed information of the resource, you are required to login. Please keep your password confidential. Currently, the download limit for each person per day is 500M. IP addresses that used the account will also be recorded. If your account is illegally used by other people, the system will close the account and implement investigation. We suggest you use a strong password. For more information about EZproxy, please contact Management Information Technology and System Office. XJTLU SSL VPN facilitates and secures you to work off campus from a range of access methods including window, Mac and Linux. You can use SSL VPN (https://sslvpn.xjtlu.edu.cn) to access campus internal websites, file server, and mail server at home or during your trip (Please refer to SSLVPN Manual). Furthermore, VPN logon popups a web page to guide you access different XJTLU resource. If you have any problems, please contact the Help-desk at 1264. Management Information Technology and System (MITS) Office. It is only opened for XJTLU Staff and students. If you are on campus, please access the databases directly without using VPN.